scrolling on your sidebar. You can then add more buttons by copying the code for the button and pasting it in front of the end tag (which is < and then /and then marquee and then this > again. After playing with it a while, I found one on Katie's blog that scrolled up, but showed more than one button at a time. And I think I like that one more. So I did a little tweaking and I am now trying to decide which one I like more. They are both on the right column of my blog, so let me know what you think. So hopefully one of those will work for you. Happy scrolling blog button making! Oh, and totally off topic. Do you remember when Bob Barker hosted the price is right and at the end of each episode he would remind you to spay or neuter your pets. 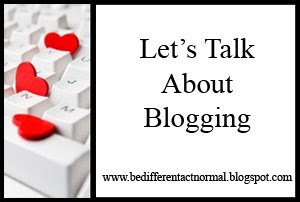 Well at the end of each 'Let's Talk About Blogging' post I am going to remind you to add your email address to your blogger profile! but anyway, thanks so much for the code!! definitely the 2nd one with more buttons! AWESOME! MINE'S UP! (Now I'm just adding buttons! Thanks for the tips. I did know about the height and speed. I made mine a little taller than yours I think. And I really don't like any of the speeds. I left them at 3 because I thought 2 was too slow and 4 was too fast. Lori... thanks soooo much! I couldn't get the first code to work. I was unsure where to paste the buttons and every time I tried they just showed up weird. I really like that first one but could not get it to work. sad! BUT... the second one worked like a charm!!! I have it working now on Blue Cricket!! !Thanks again for a great code that is soooo useful! I'll have to keep working on the first code. Any clue what I'm doing wrong? Thanks so much. I can't wait to give this a try. I think they both look great! I like scrolling button #1, side by side. Thanks for the code! Awesome! Thanks for sharing this with us! Thanks! I just added this to my blog!! Even *I* got this to work! Thank you so much for this!! Huge help! !